To promote language in our late talker, I used communication temptations and labeled everything we saw and every action we did during our daily activities. It’s important for us to clearly and slowly model words for our little loves, because listening to us helps them develop language. There’s a lot you can do to help your sweetie speak, too. Cross-my-heart, it’s not too much work and definitely worth the effort. 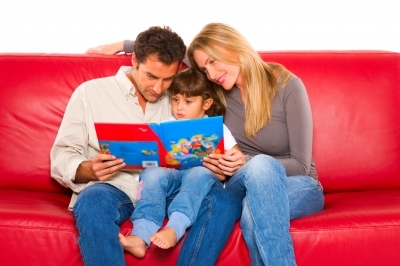 Here are a few examples of what you can do to promote language in your quiet kiddo. Early talker: Prioritize storytime to promote language. Curl up with your cutie and books that have big, bright pictures. Help her point to images while you label what they are. After you’ve modeled the names a few times, pause to encourage her to say the same. Reinforce her words with hugs, kisses or animated actions that make her giggle. To work on receptive language as you read, give her very simple and clear instructions: “Show me the pig,” “Point to the balloon,” or “Find the apple.” Make her successful from the beginning by helping her (your hand over hers) find it immediately after your request. Do this a few times and then fade out your physical prompt, so she can do it independently. Intermediate talker: Chances are, your babe has her books memorized. Great! The repetition of reading the same thing over and over may seem mind-numbing to you, but it helps promote language in her. As you read the story, pause several times throughout and wait for her to fill in the words. And talk about her favourite pictures. Ask open-ended questions, such as “What is Caillou doing?” “What happened to Swiper?” or “How does Thomas feel?” Encourage your kiddo to respond with multiple words, modeling sentences, if necessary at first, to help her along. Early talker: Promote language in the tub! Choose a few things your babe loves in the bath and label them several times as she soaks. Talk clearly and slowly as you say, for example, “bubbles” or “duck.” As soon as she imitates you (the articulation doesn’t matter yet, it’s the verbalization that counts), get excited and play with the item or give her tickles. Have fun! This positive reinforcement will encourage your angel to use the word again. Continue to label the same items every time she has a bath until she starts to say the names independently. Then teach her a few new words in the same way to expand her vocabulary. Remember, have a hoot with your babe as you practice talking in the tub! TIP: When she can label a few things by herself, encourage her to ask for what she wants. Hold up the bubbles and wait for her to say “bubbles” before you blow them. You may have to show her what to do a few times at first, so she understands the expectation. When she requests “bubbles” by herself, get excited and blow a lot! If she stays quiet, put the bubble wand back in the bottle. Intermediate talker: If your sweetie has mastered one- and two-word sentences, help expand the length of her verbal expressions. For example, take turns while singing her favourite songs. You belt out one line and she trills the next. Fun! It’s a great way to practice saying a few words at a time. You can also turn body parts into talking points. Ask her, “What’s this?” as you point to your honey’s nose, hands or mouth. After her response, follow up with,“What can you do with it?” Model the language at first: “I smell with my nose.” Then sniff something she enjoys like shampoo, soap or bubbles. Be animated, so she pairs this speech with a positive experience she’d like to have again. Early talker: To promote language, teach your tyke the names of her favourite foods at mealtimes. When you take her grocery shopping, find those foods and ask, “What is it?” As soon as she says “banana” or “cracker,” give her a bite and get excited. (Bigger grocery stores are usually okay with this providing you pay on your way out.) Also introduce and practice counting. Let your honey help you put 5 tangerines, for example, into a bag, counting the fruit as it goes in. Be animated and engaging, a la Sesame Street, so she thinks counting is fun and wants to do it, too. TIP: Once your love is regularly counting with you, encourage her to say the numbers by herself. At first, pause before you say “5,” giving her the chance to fill in the numeral. When she’s mastered #5, target #4 in the same way; then #3, #2 and #1 until she can count to 5 independently. Intermediate talker: Pre-shopping, invite your angel to help you with the grocery list. Ask her to tell you 3-5 things she would like to buy. Be clear that you expect her to say the whole thing, modeling for her a few times: “I want strawberry ice cream,” “Let’s buy pizza” and “I want 6 bananas.” Add her requests to the grocery list only when she says the complete sentence; then search for those foods at the store. Sleuthing games are awesome! Take her to the appropriate aisle and give her an instruction (this works on receptive language) that matches her skill level. For example, “Go get 6 bananas” or “Find a food that has pepperoni, cheese and sauce on it.” Finders keepers!